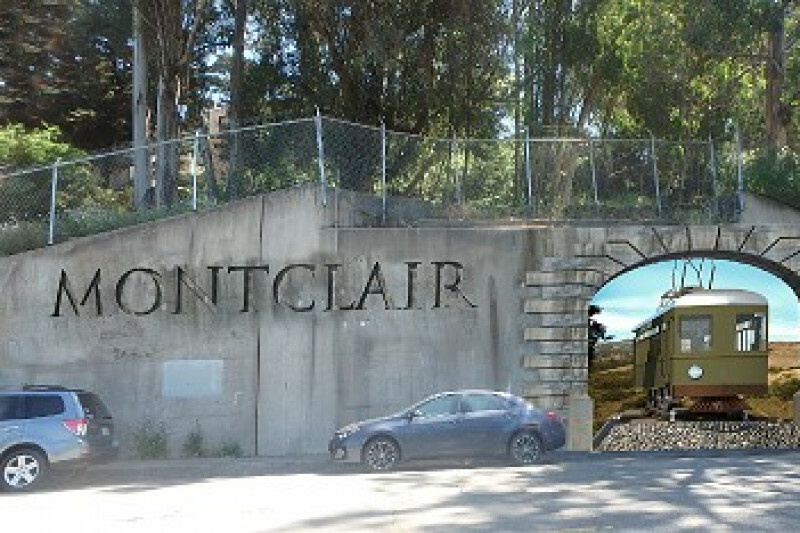 All that remains of the Sacramento Northern Railroad that ran through the Montclair district of Oakland, Calif. is a large concrete eyesore at the entrance to Montclair Village. The passenger car that carried travelers yearning for a day in the country was known as The Short Line, and for a $1 you had a ride to Moraga from San Francisco, traveling thru and into the hills of Montclair. The foundation for the railroad trestle as the train climbed into the hills has stood quiet and unassuming since 1957. It is big too: 145 feet long, 25 feet high. Local residents are working with Andrew Johnstone, artist, muralist and design steward of The Man, yes Burning Man, to install an amazing trompe l'oeil mural on the old trestle foundation, a permanent work of art to honor the history of the railroad that once ran here. Volunteers have raised more than half of the funds needed - your donations will be greatly appreciated to begin the project this summer. This is a simple working image of the mural. Andrew Johnstone will add historically accurate details as he paints! See a video here of the Sacto Northern train making its way thru Rockridge and eventually into Montclair. What rich history- help us tell the story! The mural prototype currently displayed for fundraising is not exactly what will be drawn. Since this prototype was created, which was almost 2 plus years ago, the artist and team have done more research of details, colors, etc. What will be drawn is completely in keeping with the passenger rail that went thru Montclair, honoring details, colors, down to font style. Thanks! Our scheduled start date is just days away! Contribute now and be part of the history!